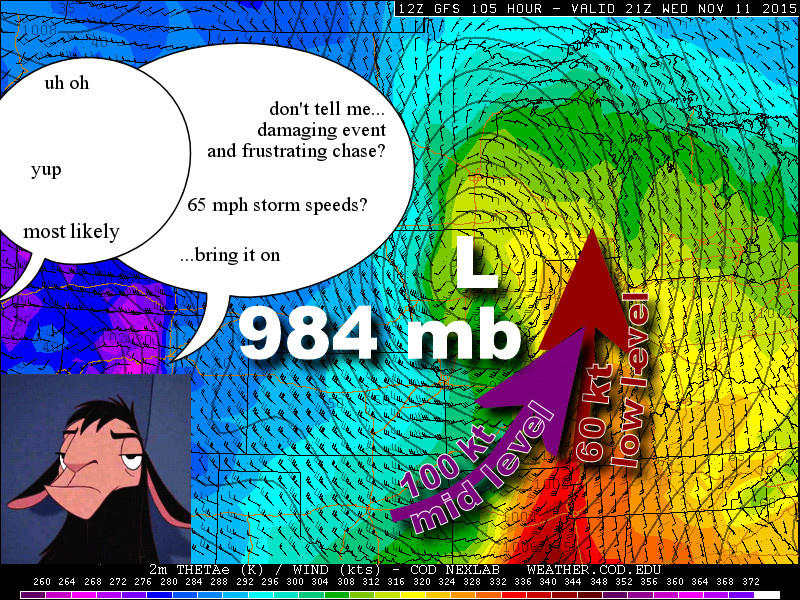 Late season extreme shear, low cape play in extreme se NE/sw IA. Targeted Nebraska City area for early afternoon initiation of supercells. Intercepted storm west of NE City noting ground scraping, but cold mesocyclone. 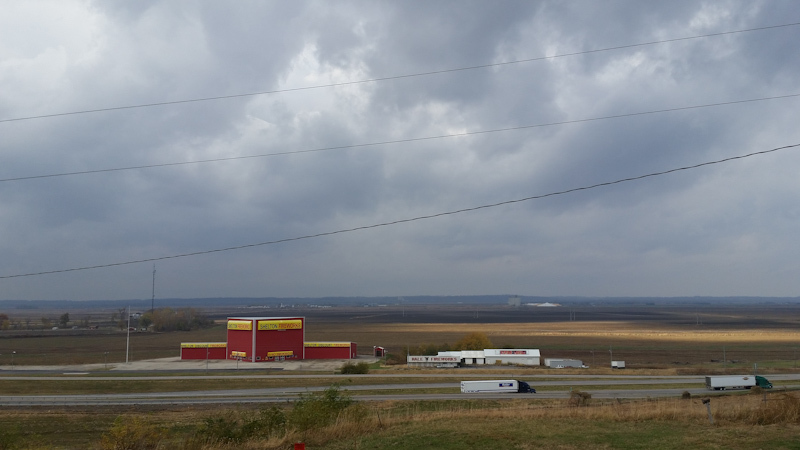 Storm gusted out so tracked east on highway 2 in Iowa letting fast moving storms cross in front of me. Noted brief, partially rain wrapepd tornado west of Mt. Ayr. Tornadic storm further east was completely rain wrapped despite being close to confirmed tornado. Storms lined out by late afternoon so called chase. Forecast meme from The Emporer's New Groove. A deep surface low with extremely strong mid and low level jets was forecast to setup over the Missouri River Valley on November 11 bringing strong warm air advection with it. It looked liked a potent severe weather setup, but it also meant incredibly fast storm motions, something I'm not too keen on chasing. Lots of storms were forecast, but given storm mode and rather marginal instability, SPC went with more modest tornado probabilities. Not much of a cap was forecast and with strong dynamics aloft, storm initiation looked to occur early. I left the house the night before, and camped in the van in the middle of northern Missouri. I arrived at one of my usual perches overlooking the Missouri River Valley by the next morning. 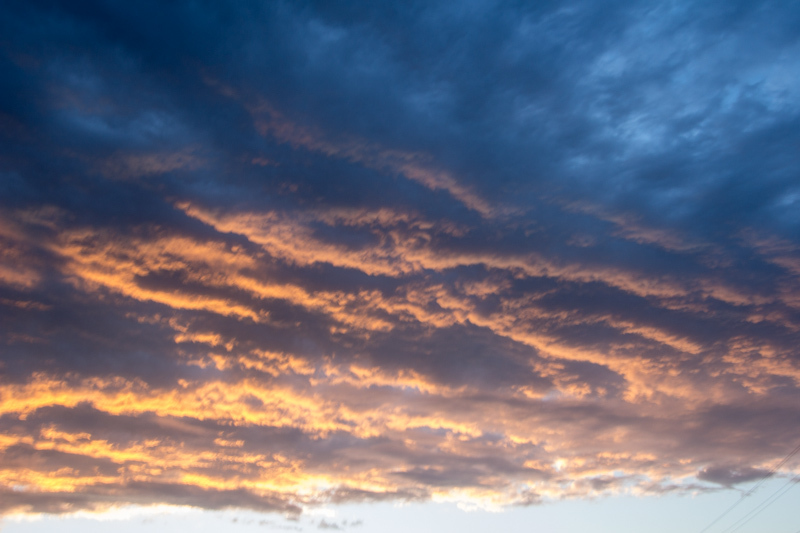 Moisture, noted by the thick cloud cover, was streaming in from the south. Storms fired around noon in eastern Nebraska and I was moving in for the intercept. The cool surface temps made for ground scraping bases. 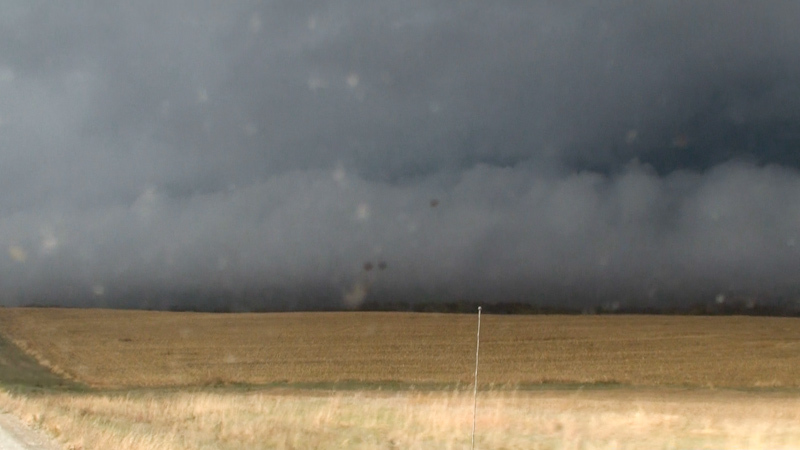 The first thing that came into view was an inflow band with just a super dark crevice underneath. I had no view of what was happening under the base. I followed the inflow band west into the storm's inflow notch. 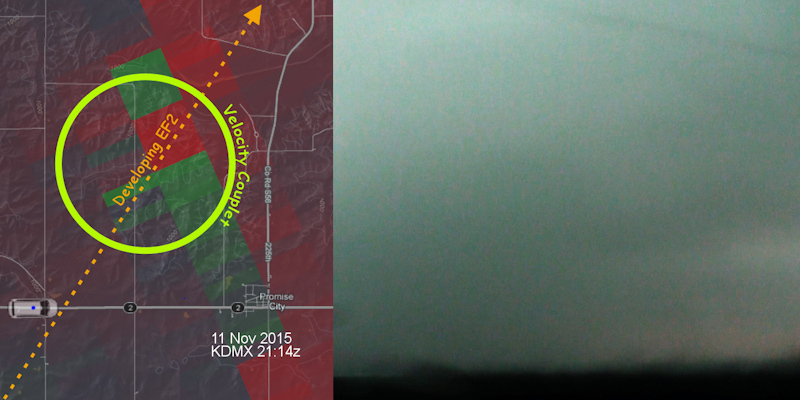 A barrell shaped mesocyclone emerged, again with only a black crevice visible underneath. It looked incredibly ominous. With no view under the base, I had no idea what was happening under there. Given how low the bases were and the strength of the dynamics, I was worried a fast moving wedge might be lurking inside. I approached with caution. As the storm quickly approached we finally had a view to the other side. The storm's base was practically at tree top height, but there was no tornado underneath. It was pretty cool at the surface so the thermodynamics might not have been primed yet for a tornado. I met up with fellow chaser Nick Nolte at about this time and we wound up caravanning for much of the chase. Moving east to stay ahead of the monster storm, it looked like it was starting to gust out. Nolte and I stopped at a highway intersection to assess the situation. Then the gust front hit and we were blasted by incredibly cold outflow. The storm looked like it was falling apart as the base moved overhead. No tornadoes here. We started tracking east across Iowa. A broken line of storms had fired just to our east and we moved to intercept them from behind, letting them cross the highway before intercepting the next cell down the line as it crossed. Just west of Mt. 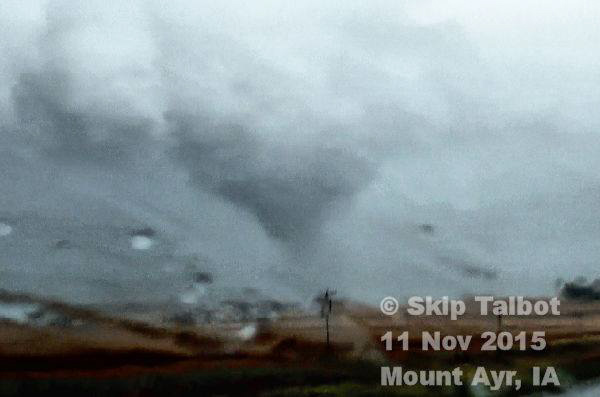 Ayr, as a break in the line and view of an updraft base emerged, I noticed a distinct nub lowering on the back end of the base. It crossed the highway in front of me and as it rocketed off to northeast it looked like it condensed down into a well defined cone. 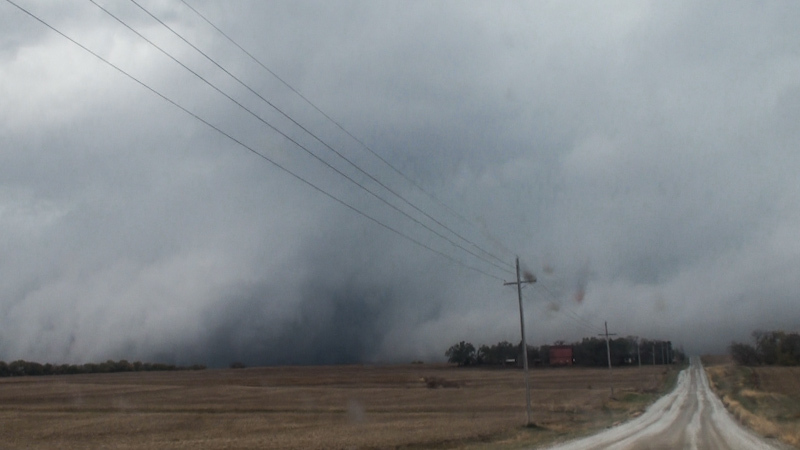 The funnel cloud didn't reach the ground, but it looked like a debris cloud was evident in the video. The feature also correlated well with damage reports that came in from the area. 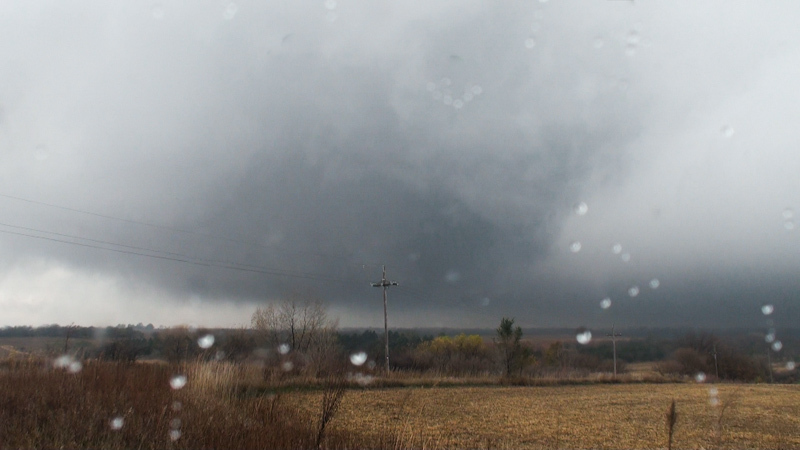 A brief tornado, and my 100th of storm chasing career! Another cell in the line crossing in front of us near Promise, IA had a warning with reported tornadoes. The velocity couplet indicating a developing tornado was within a couple miles as it too rocketed off to the northeast, but this storm was completely rain wrapped. Only green murk could be seen to the north. The line filled in and congealed, signalling the end of the tornado play. It was becoming difficult to keep up with the fast moving line too, so Nolte and I called the chase and split. 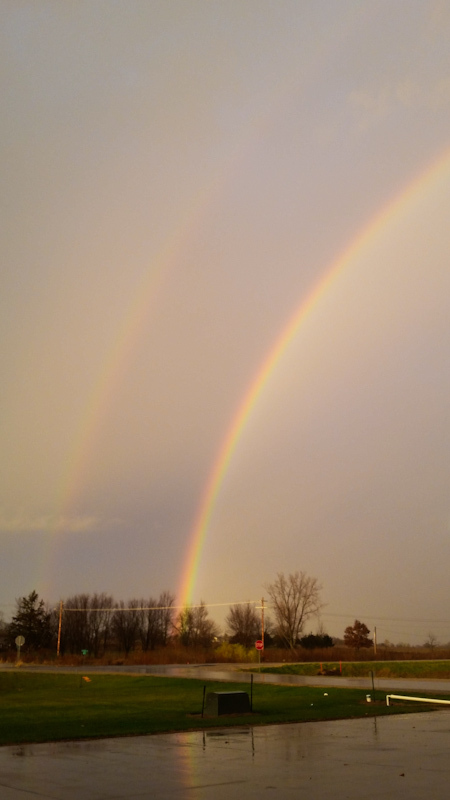 There were some pretty sights behind the line including a double rainbow and colorful sunset. 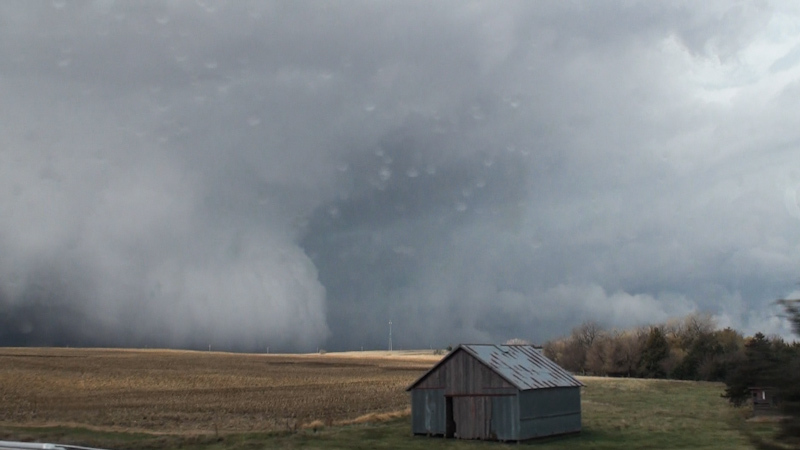 Numerous tornado reports came in across Iowa during the event, but they were incredibly difficult chase catches, either buried in the rain or moving at lightspeed. Given the setup, the location, and time of year, I was super happy that we managed to squeak a tornado out of this chase. Even if it was brief and not photogenic. 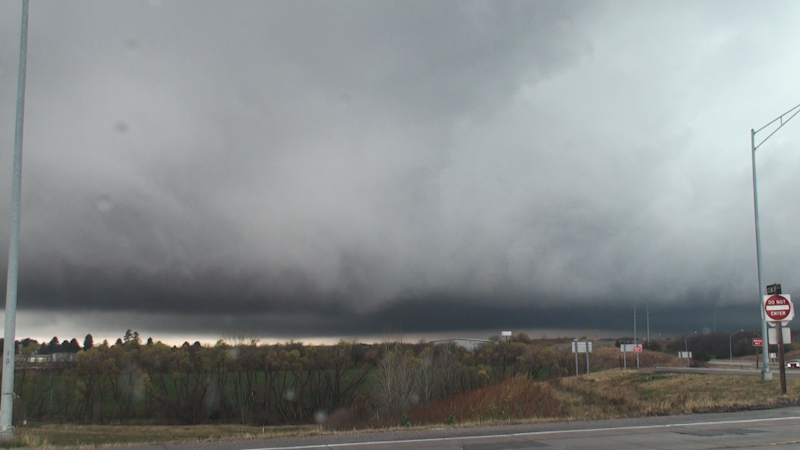 The menacing supercell at the start was impressive too, but blasted apart by cold air. On a fast moving broken line, chasing from behind as cells cross in front can offer the only view sometimes.